Radioplayer Car brings voice control, streaming and intelligent signal switching | What Hi-Fi? Radioplayer Car will swap between DAB, FM, and streaming radio depending on which signal is strongest - but Amazon Alexa will give it tough competition. With voice control being the hot new thing, radio heads will be happy to hear that the first 'smart radio' system has just launched. The system will automatically switch between DAB, FM or streaming radio, depending on which is the strongest signal at the time. 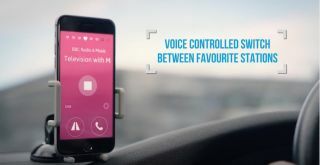 Developed by Radioplayer, which is a collaboration between the BBC and commercial radio stations, 'Radioplayer Car' is a box that is fitted behind your dashboard, and connects into the auxiliary input of your existing car radio. Using the free app, you can then connect your iOS or Android smartphone to the box, allowing you to control the system with your voice.